In recent years, especially along the Lake Michigan shoreline of Michigan, we have been blessed with some dramatic, amazing views of the Northern Lights or Aurora Borealis (as it is officially known). 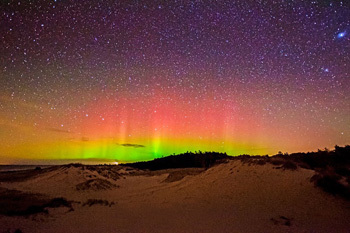 This natural phenomenon can fill the night sky with surreal color, sometimes appearing as a slowly shifting glow, occasionally looking like colorful curtains waving in the breeze. 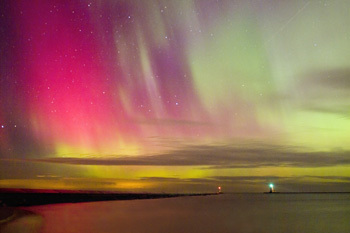 There is no guarantee you will see the Northern Lights, even if you are in the best areas. However, a bit of planning will increase your chances. Since darkness is required for the best viewing, the rural areas along the Lake Michigan shoreline are ideal for viewing. According to Wikipedia, the time between 6pm and 4am is the most intense period of the day. The highest probability within this time span is between 10 and 11pm. However, this is only a guideline. In periods of strong activity, one can expect several flares starting at around 6pm, peaking around 10pm, and going on until 1am. In the longer term, auroral displays are correlated with an 11-year cycle in sunspot activity; the more restless the sun, the more aurorae. The next maximum in solar activity will be around 2013, with frequent Northern Lights displays likely for another two or three years after that. Taking good pictures of the Northern Lights is very difficult, but local photographers have managed to capture some amazing images. 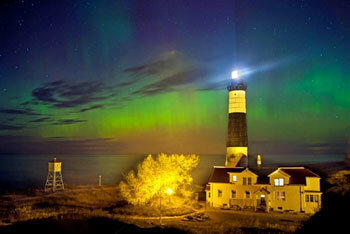 Here are some tips from Brad Reed (Todd and Brad Reed Photo Galleries of Ludington) to help you with photographing the Northern Lights. The number one thing Brad recommends is to download an Aurora forecast app for smartphone users, which can be found by searching for Northern Lights forecast or Aurora forecast in the app store. People can also get email alerts from the Geophysical Institute at the University of Alaska. When setting out to photograph the Northern Lights, Brad suggests using a sturdy tripod and a camera equipped with manual settings. For Todd and Brad's most recent photos, they set their cameras to a shutter speed of 30 seconds and an aperture of F3.5 at ISO 6400. This allows as much light to enter the camera as possible. For people looking to make star trails in photos like those seen in "North Star", set the camera to the BULB setting which allows the shutter to remain open as long as the shutter button is held down. The star trails in "North Star" were created when Brad held down the shutter button for 32 minutes.